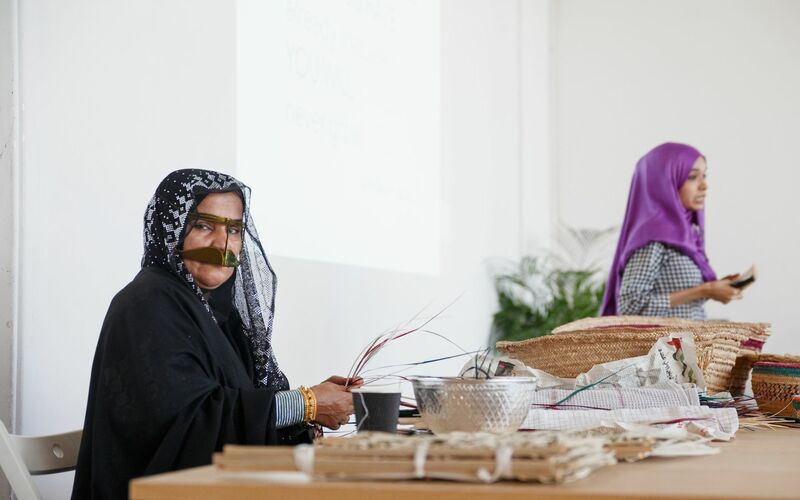 Asna Moazzam from ard ارض hosts a one-hour live demo of Sa’af, the ancient Emirati technique of weaving with date palm leaves. 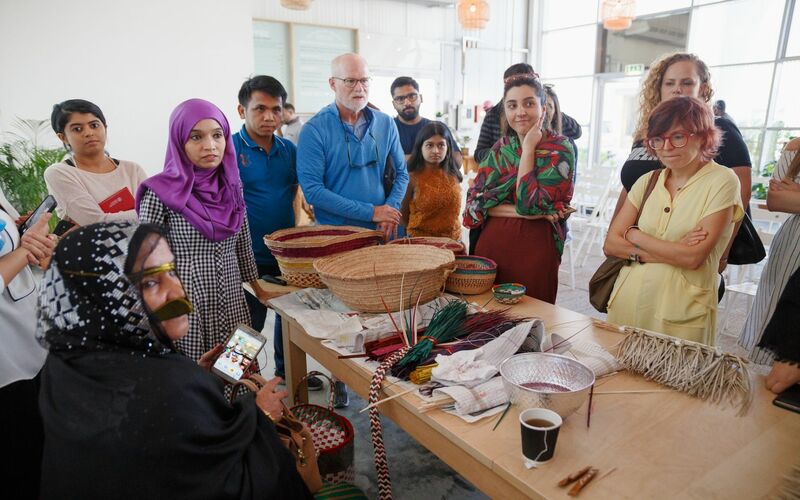 Ard ارض and DesignAware have partnered with social initiative Sougha by the Khalifa Fund for Enterprise Development which is shaping the future of Emirati artisans by preserving the UAE’s heritage and fostering sustainable entrepreneurial opportunities. This live demo offers visitors the unique experience of interacting with Bedouin craftswomen. 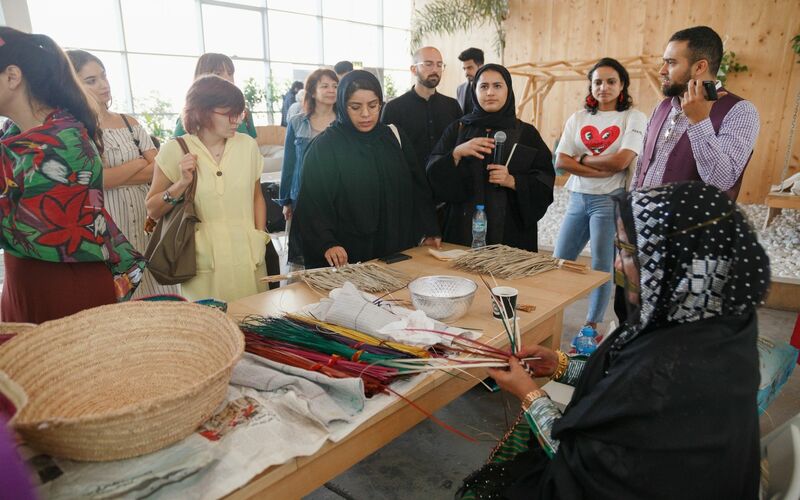 They will be taught the process of preparing date palm leaves, dying them with colours and the ancient craft of weaving, a technique known locally as Sa’af, which is unique to the Emirates. Drop in and witness craftswoman Sheikha Saeed's live demo. Ard ارض is a sustainable design initiative that has its roots in heritage and vernacular architecture. ard ارض is currently reviving the vernacular architecture of the UAE in a contemporary format through technology and research. It aims to bring Arish: Palm Leaf Architecture into the heart of cities and revive the craft in a way that it integrates with the built form of today, adding a deeper sense of cultural continuity to the modern fabric of our urban centres. DesignAware was born from a desire to create awareness through liveable, wearable, usable, accessible and responsible design. With its presence in Hyderabad, Dubai, and London, the studio focuses on process-oriented design. DesignAware’s projects range from lighting to furniture; interior design to renovation; and residential, commercial and institutional architecture. It also runs socially relevant projects, such as a school for students from disadvantaged backgrounds in the heritage zone of the Golconda Fort in Hyderabad. In a non-profit endeavour, DesignAware successfully raised funds and contributions to build the context-sensitive school on a tight budget through a social media campaign.